acknowledgement for Seismology Center, Central Weather Bureau, Taipei, Taiwan, Deprem, Turkey, and JMA. Blue dots show epicenters of aftershocks determined by CWB (Taiwan Central Weather Beaureau). Lighter color shows shallower events. TCU129 and TCU078 waveforms integrated from acc. data distributed by Lee. Maximum acceleration distribution. Triangles show the station whose max. value information were released. Max value means the maximum value of three component maximum values. Contours corrspond seismic intensity boundary. Comparison bet. max. acc. of three components. Yellow dots show the Chelongpu fault (The earthquake occurred mainly on the active Chelongpu fault.). Comparison bet. max. vel. of three components. Yellow dots show the Chelongpu fault (The earthquake occurred mainly on the active Chelongpu fault.). Comparison bet. max. disp. of three components. 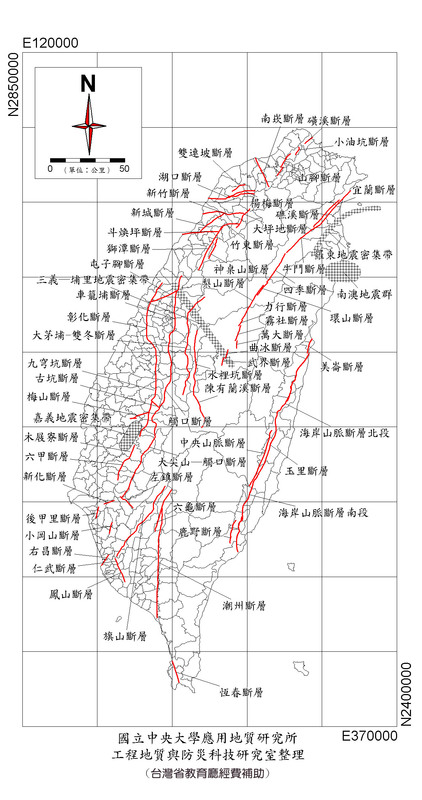 Yellow dots show the Chelongpu fault (The earthquake occurred mainly on the active Chelongpu fault.). h Comparison bet. vertical and horizontal (larger values of EW and NS comp) components of acceleration and velocity.